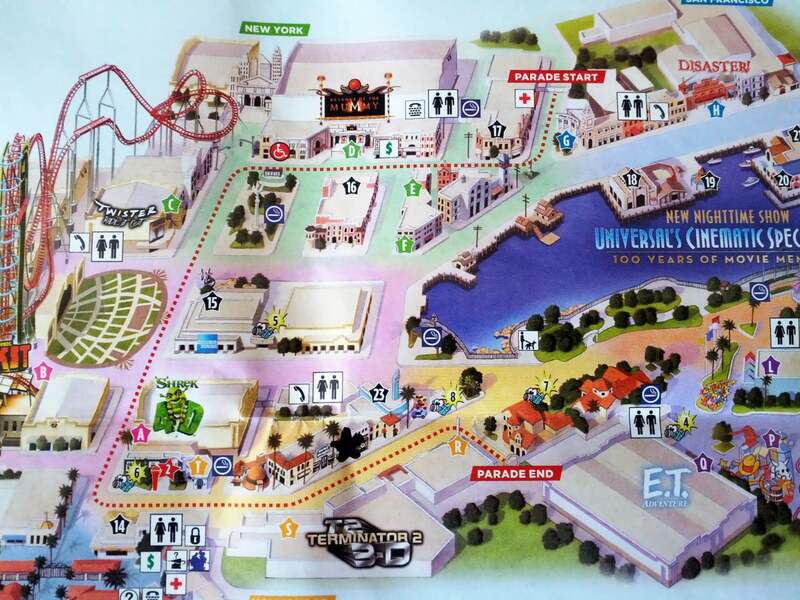 Universal’s Superstar Parade: Map of the parade route. 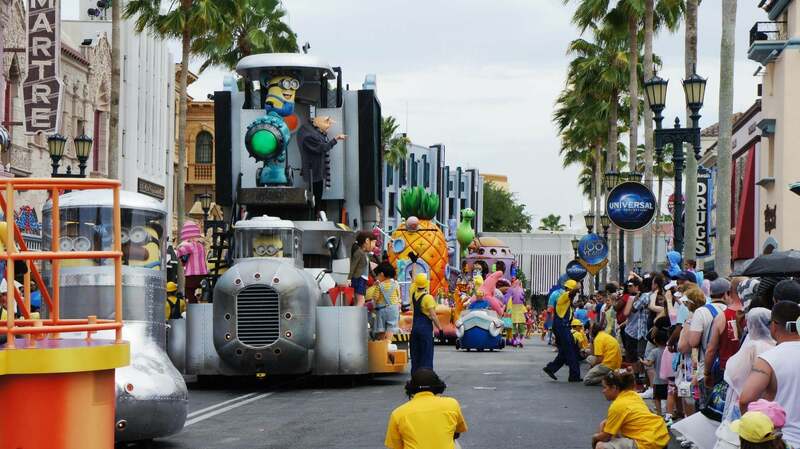 Universal’s first-ever daily parade brings guests face-to-face with their favorite characters, larger-than-life floats, and dozens of street performers, all set to a high-energy soundtrack. Expect to see Gru and his minions, SpongeBob and friends, Dora the Explorer, and many more fantastic creations. The parade is scheduled daily — see the current scheduled time by clicking here — and is about 20 minutes long. There are also additional meet-and-greet opportunities with the parade’s characters that occur throughout the day. See below for more information. 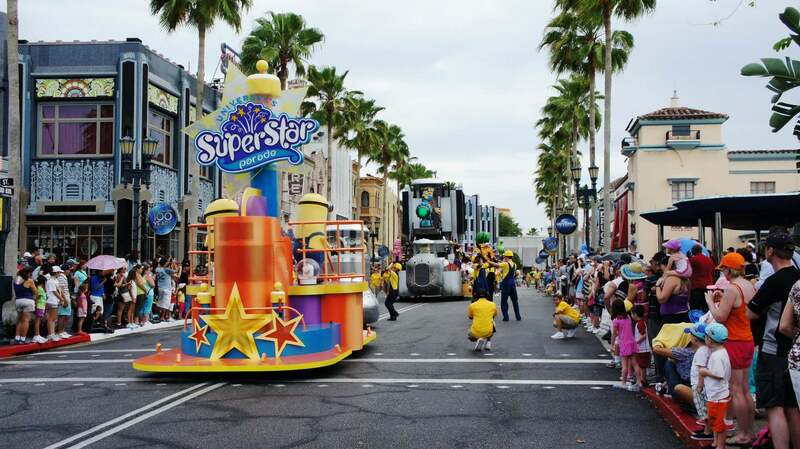 Universal’s Superstar Parade at Universal Studios Florida. While it’s difficult not to be entertained by Universal’s Superstar Parade — especially for young kids who know the characters by heart — more thrill-conscious guests will want to use this time to jump on Rip Ride Rockit or Revenge of the Mummy one more time. Throughout the day at Universal Studios, the floats and characters in the parade come out to Hollywood Boulevard — near Mel’s Drive-In — to perform and frolic with park guests. 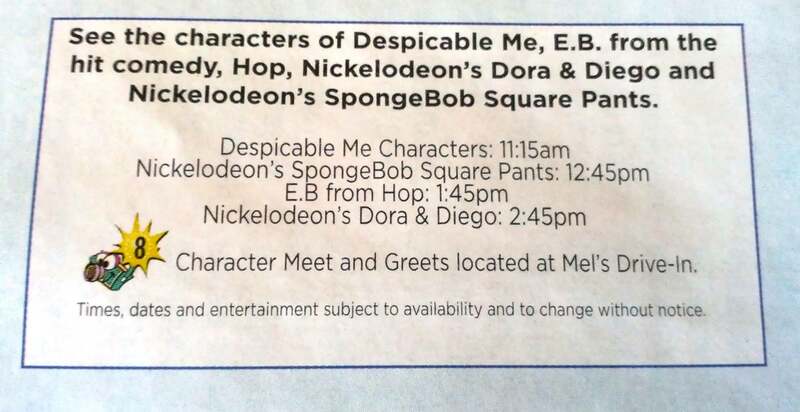 The times for these additional meet-and-greet opportunities are listed in the in-park map. 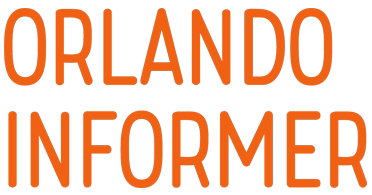 Universal’s Superstar Parade: Meet-and-greet opportunities. Where’s the best place to see the parade? 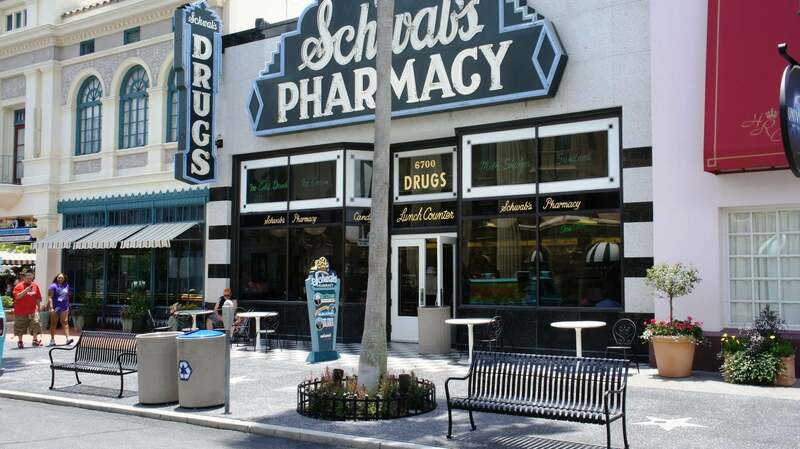 Best spot to watch Universal’s Superstar Parade: Schawb’s Pharmacy. There are a few reasons why this is the prime location to view the parade. First, there are benches right along the curb. So, if you get here early enough, you can grab a front row seat that actually allows you to sit! Second, most of the time you can pick up some ice cream at Schwab’s to pass the time while you’re waiting for the parade. Best spot to watch Universal’s Superstar Parade: Across the street from Schwab’s Pharmacy. This spot too has its advantages. For one thing, there is a concession stand that sells soda, beer, etc. In addition, there are gift shops inside the building facades you see in the photo, so members of your party can duck in for a blast of cool air, if needed. If you look on the right side of that image, you’ll see the vertical Schwab’s DRUGS sign — that’s where you should be sitting. Or directly across the street. Looks like a good spot, right? It is worth noting that the parade also stops earlier in the route, near Revenge of the Mummy in the New York area, and also does their extended street performance. But in our opinion that area is just not as good of a spot for watching the parade as Hollywood Blvd. great parade i loved it and i love this site it wass so helpfull i got the perfect spot. We love, love, love this parade! All 6 of our grandchildren were with us during this last visit ... from our oldest, a very "grown up" 10 year old to our youngest, a very TV savvy 14 month old. Every one of them was enthralled with the many characters they know & love, the beautiful floats, the music & the energy! As much as we enjoyed it last year it was far better with our grandchildren! Can't wait till we visit again next spring!! 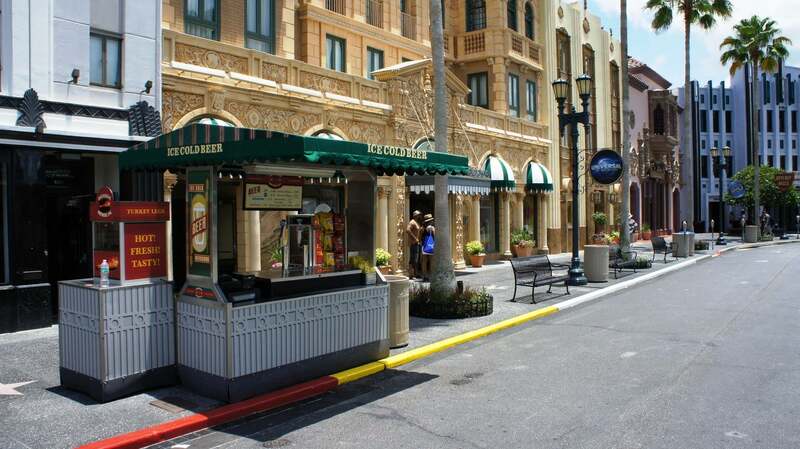 The Superstar parade is a true hidden gem hidden in the middle of Universal Studios Florida. The best area to watch is the Hollywood area between Terminator and Mel's. The reasons are two fold. First, prior to the parade, Lucy, Marilyn, Scooby and Shaggy and others appear for photo ops. Second, the parade comes to a stop and there is a show that involves all the floats with different music for each character. The parade allows you to take a break and be entertained all at the same time. It is by far my favorite part of any day at the park. I thought this was a fun parade for all ages. It had all the grandkids favorite characters dancing down the street. I especially like seeing Sponge Bob and Patrick (my favorites). But is was great to see the Despicable Me folks in it too. Not too log of a parade so take a little time and enjoy. This parade is very high energy, and as a performer myself, I admire Universal's Team Members for giving kids some great entertainment. The actors are really committed, especially the Monkey on the trampoline. If he didn't have a human face, you'd think he was a monkey! The human minions were also like this. 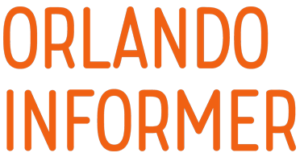 Kids will love this, and have a great time, but adults may not like it because it is juvenile--- which Universal is trying to do with their parks, to draw more children in. This is a great attraction for young kids, but I give it three stars. As an almost 16-year-old, I thought it was cute, but not overly appealing.